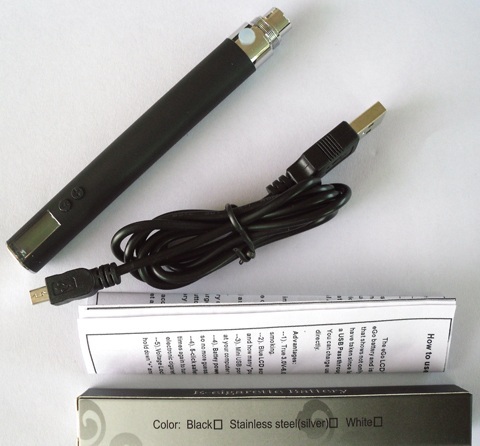 EGO Variable Voltage USB-Passthrough with 650mAh rechargeable Li-Battery and LCD display. Allows the user to control the volts to heating coil. More volts increases Vapor production. Choose from 9 colors. For the 1100mAh Variable Voltage battery, Click Here. FEATURES: * True 3.0V-6.0V Variable Voltage (In 0.1V Increments) *Voltage Lock-Down function *5 click On/Off *Micro USB port can be used as USB Passthrough battery. *Blue LCD Display shows: Output voltage, remaining battery life, and how many Puffs taken since last charge. Scroll Page for How-To Guide. To turn the battery on or off simply click the power button five times. The "puffs" counter is automatically reset each time you charge the battery. If you would like to reset it before then simply click the power button 5 times to turn the battery off, then press and hold the power button for 5 seconds. The LCD backlight will turn on, then click the power button 5 times again to turn the battery on again. The "puffs" counter will now be reset to 0. 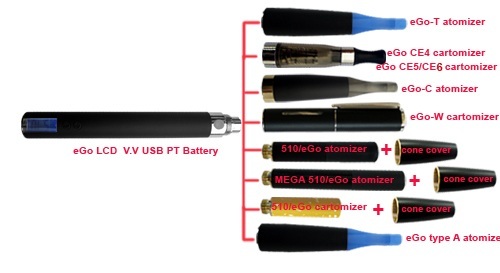 Using your EGO variable voltage battery is as simple as connecting it to any EGO-CE4, EGO-CE5, EGO-CE6, EGO-T, EGO-C, EGO-W, EGO, EGO typeA, or any EGO Series Atomizer/Cartomizer/Clearomizer. Once connected your battery will be in a stand-by state, so just press the LED power button and Vape! When the low battery symbol on your LCD screen flashes it's time to charge the battery. Connect the mini USB port at the bottom of the battery to the USB port of your computer using the included cable. The LCD backlight will turn on the the battery symbol will flash during charging. Once charging is complete the backlight will turn off and the battery symbol will read full. NOTE: The EGO variable voltage battery can only bem charged via USB port and will not charge via the threaded battery connection. The EGO Variable Voltage Battery is a true variable voltage battery that is easily adjusted from 3.0-6.0V in 0.1V increments. It's also equipped with a blue LCD screen that shows not only the output voltage but your remaining battery life, and how many "puffs" since the last charge. The battery also has a convenient USB port at the bottom and can be used as a USB passthrough — you can vape at your computer while the battery is charging! You can easily recharge the battery using the USB port of your computer, a universal AC-USB adaptor or the car charger. Control output voltage in 0.1V increments to get your perfect vape, every time! Easy to read LCD screen that shows output voltage, remaining battery life and how many "puffs" you have taken. No more guessing when you need to recharge! The mini USB port on the battery can be used as a USB passthrough, meaning you can vape at your computer while the battery is charging. Easy 5-click safety cutoff means you'll never accidentally turn your e-cig on or off again. Just click the power button five times to turn the battery on or of — perfect if you typically carry your electronic cigarette in your pocket or purse. Voltage lock down function prevents accidental changes to your output voltage. Just hold down the + and - buttons together for 5 seconds to set and release.